Boardsports, bike rides and visiting the vineyards: each to his own on holiday! With days full of energy or full of relaxation, there's something for everyone! 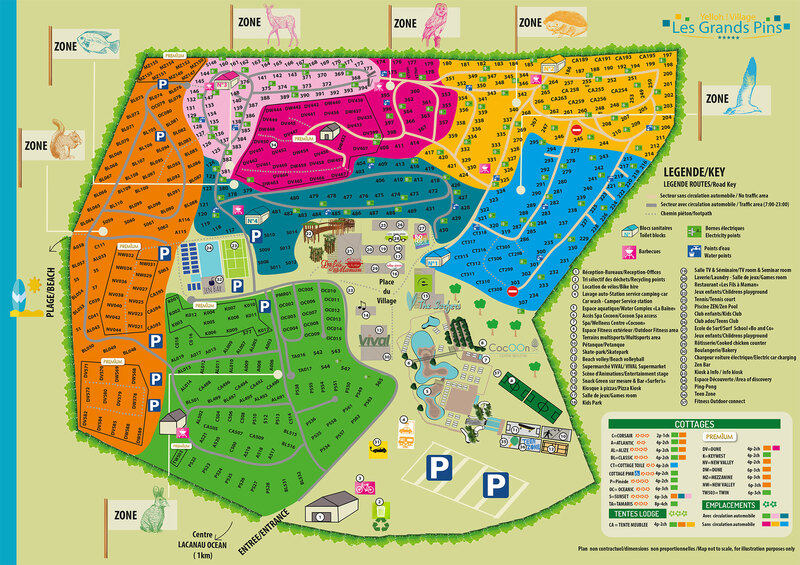 The camping Les Grands Pins has a wide choice of entertainment and activities. People who enjoy boardsports will love trying out some surfing or improving their surfing technique via the surf school in the campsite at Lacanau. The ocean is just 350 metres away and can be reached directly via a path through the sand dunes. You'll also love the very varied programme of activities with volleyball, tennis, pétanque, an outdoor fitness area... and plenty more, providing an incredible range of activities for everyone and every age. And during your stay, why not enjoy a real bit of fresh air during a hike or a bike ride along the various cycle paths in the region! Perfect for recharging those batteries whilst enjoying a quite unique area of countryside! In Lacanau, countryside and sports are inseparable! Everything is in place to make sure you enjoy a reinvigorating and stimulating holiday, whether you're on foot, on horseback, in a canoe or on a bike, or if you're enjoying all sorts of different sports. From April to September, the Yelloh! Village Les Grands Pins has a wide range of activities for you to choose from. For further information, please do come and talk to us at reception. BO and CO: a surf school in the middle of the campsite! Bernard and Olivier, seasoned surfers who have been instructing for a long time, will be really pleased to share their passion with you. The method they use means surfing becomes accessible to everyone, with gradual, personalised training provided by an experienced team of state-authorised instructors. From April to September, equipment hire, lessons and training take place from the campsite. Book your SURF packages online via the "Book your stay" tab. Just a 10 minute drive from the campsite, come and have a go at the delights of kayaking and standup paddleboarding, set off for an adventure with the family or with your friends and explore the lake at Lacanau, with its little "conches" (sheltered inlets) and islands. Cruise down the canal that passes through the Étang de Cousseau nature park, and enjoy the protected plants and animals you'll find here. Services must be booked online, using the "Book your stay" tab to take advantage of great prices. During your holiday, try something totally new with our outdoor escape game. Grab the family and head off on an adventure. What better way to switch off from the rest of the world, unwind and have fun all together! Explore the campsite, beat the challenges and solve the riddle. With its unique concept this game is set to be a winner for all ages. But don’t take our word for it, download the free app and get ready for a new experience! You're on holiday, so it's time to forget the car! Leaving from the camping Les Grands Pins, you can set off for a walk in the forest and really make the most of the huge 100km network of cycle paths. This is a great way of exploring the region, and of seeing the lake and the pine forest. You can hire bikes for adults and children at reception by the half day, the day the week or the fortnight, as well as child seats and helmets for little ones, plus child trailers. There is also a bike repair station on-site. Les Grands Pins was awarded Accueil Vélo bike friendly status in 2013, and welcomes cyclist holidaymakers who have come to enjoy the famous VELODYSSEE route, among others. The town of Lacanau has 3 lovely golf courses just 5 minutes' drive from the camping Les Grands Pins, including the Garden Golf de Lacanau, which is an 18-hole international course. Méjanne golf course was voted France's best 9-hole golf course in 2012 and Le Baganais golf school (9-hole par 27) has a driving range for 50 people and various training areas. These two golf clubs are managed by UCPA. All 3 complement one another very well, and will ensure you enjoy a great deal of pleasure and really get away from it all! Whether you're a beginner or an expert, you'll love Lacanau's golf clubs. Just a 5 minute drive from the campsite, le Baganais mini golf club is a simple and fun means of enjoying golf, for adults and children. Designed to suit everyone, whatever the age group, you'll have a great time as well as find out about the sport's culture. Discounts available for customers staying at the camping Les Grands Pins. And just a 15 minute drive from the campsite lies Lacanau Equipassion, a horse riding club with various options, including walks and treks on horseback or on ponies, and training. There's also a horseball school and equitherapy. Whatever your ability, come and enjoy the forests and beaches from horseback, in a club with a lovely atmosphere run by Safya! When the sun sets at les Grands Pins, let the show begin! With live concerts, magic shows, cabaret, dance evenings, quizzes, karaoke and more, there's something for people of all ages to enjoy! We even have a giant screen on the stage in the village square, ready to broadcast all the major sports events of the moment.